Iran plans to pose a nuclear threat, is improving its missiles' operations and is also testing cyber warfare aimed at aircraft systems. This is being disputed by the government of the United States and by the Israeli government. US President Donald J. Trump this week fired off one of his famous Tweets in which he criticized his intelligence chiefs and claimed that the heads of the various intelligence services in the US were "naive and passive" when it comes to Iran's nuclear threat. In his tweet, Trump probably referred to a testimony from CIA Director Gina Haspel and his Director of National Intelligence Dan Coats during a Congressional hearing earlier this week. “The Intelligence people seem to be extremely passive and naive when it comes to the dangers of Iran,” Trump wrote in his message. The Americans left the JCPOA in May 2018 and ever since, the Trump Administration has been trying to increase the pressure on Iran through reinstated and new sanctions and through measures aimed at curbing Iran’s imperialist politics in the Middle East. .
That policy has already led to results despite Trump’s announcement that the US military will withdraw from Syria, a decision which has led to opposition in both Congress and Israel. One of my contacts in the Middle East, the Jordanian opposition leader Mudar Zahran, reported this week that the Quds Brigade of the Iranian Revolutionary Guard now controls only 7 percent of Syrian territory, a decrease of 53 percent compared to the beginning of 2018. Zahran based his report on unnamed sources in Syria which are gathering information about the Quds Brigade of the IRGC and his observation confirms what Israeli army commanders reported earlier. Other good news about the Iranian threat came from David Albright, a nuclear expert and former IAEA inspector. Albright, who is following Iran closely, said that the new advanced IR-8 centrifuges for uranium enrichment in Iran are not working well because they are made of carbon fiber. The IR-8 centrifuge is 16 times more powerful than the old IR-1 centrifuge which Iran developed with the aid of Pakistani engineer Khan who stole the blueprints for the machine from URENCO in the Netherlands. “The IR-8 has been a failure. The centrifuge uses carbon fiber bellows, which involve carbon fiber tubes connected by a movable part, the bellows. They go into the shape of a banana when they hit a certain speed. You need to make them bendable. The bellow must be flexible, but they are made of carbon fiber so there are lots of problems with them cracking,” according to the nuclear expert. The only Iranian centrifuge that works well is the IR-6 said Albright, who repeated his warning about optimism regarding Iran's intentions in the nuclear field. The former IAEA inspector says that everything in Iran points to an intention to continue with the development of nuclear weapons and that the Iranian nuclear program definitely has "military dimensions". Albright's comments came on the same day that Al Shamkali, the secretary of the Supreme National Security Council in Iran, reported that the Islamic Republic has no limits in the development of guided missiles. Shamkhani claimed that these advanced missiles are already in possession of Hamas, Islamic Jihad and Hezbollah and that these terrorist movements will use them when Israel does something stupid. Other high-ranking Iranian military officials threatened that the day that Iran's "revolutionary patience" will be over is rapidly approaching and that Iran's advanced missiles will be raining down on Israel. 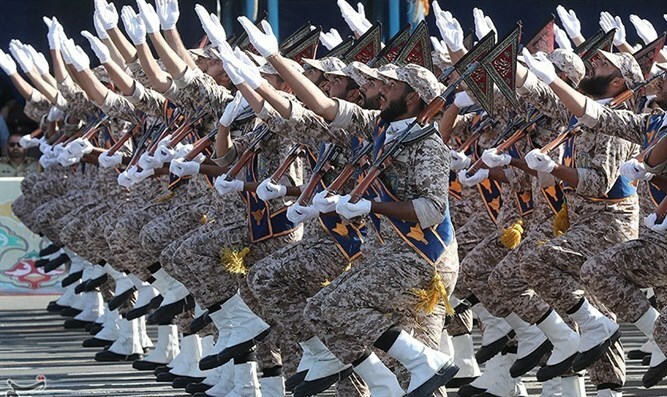 “Iran’s roaring missiles with pinpoint accuracy will rain on you in revenge for the blood of the region’s oppressed Muslims shed unjustifiably,” according to Mohammed Ali Jafari, commander of the Iranian Revolutionary Guards Corps (IRGC). Hossein Salami, the deputy commander of the IRGC, also claimed that the day of the destruction of the “Zionist project” is coming closer. “We declare that if Israel does anything that will cause the outbreak of a new war, this war will surely end in its destruction and the occupied lands will be liberated from the occupation, and there will not even be enough land in Palestine to bury their bodies,” according to Salami. Then there’s the cyber threat Iran poses to Israel. Prime Minister Netanyahu revealed this week that Israel is being attacked by Iran in the field of cyber infrastructure on a daily basis. Iran daily tries to keep Israeli aircraft on the ground through cyber attacks on air traffic control centers, communication systems and electronic systems in the aircraft. Israel is a world power in the field of cyber security and Netanyahu claimed his government is doing everything it can to increase the number of cyber start-ups and the number of foreign cyber security companies operating in Israel. Netanyahu’s allegations about Iran's aggression in cyber space were supported by a new report from Fire Eye, an American company in the field of cyber security. Fire Eye reported that an Iranian group of cyber experts operating under the name APT39 is attempting to steal information from tour operators, IT companies and telecommunication companies in Israel and elsewhere in the Middle East. Fire Eye's warning came a day after the heads of US intelligence warned that Iran was spying on the US, Israel and other US allies through cyber attacks. The annual Worldwide Threat Assessment drawn up by the joint US intelligence services warns against devastating Iranian cyber attacks in the near future. "Iran uses increasingly sophisticated cyber techniques to conduct espionage; it is also attempting to deploy cyber attack capabilities that would enable attacks against critical infrastructure in the United States and allied countries," the assessment warned.